NextAnyone for Soup? Andy Warhol and ‘The Factory’ production line! Just as Constantine had consolidated his power, and the Empire had come together politically, a new deadly heresy threatened to permanently rip it all apart. Once Constantine had defeated Licinius in 324, there was nothing really stopping him now from coming out in the open for his support of Christianity. He would for the short term continue to tolerate paganism, but what he would not tolerate was heresy within the Church. It wasn’t too long after Constantine had begun his ambitious plans for his new city at Byzantium (For continuity sake we will start to refer to Byzantium now as Constantinople) that he became fully aware of a North Africian priest named Arius and his teachings that Christ was not fully divine and inferior to God. According to Arius, Jesus as the Son of God was not the same substance as God the Father. He preached that there was once a time before the Son of God, when only God the father existed. His views were originally condemned and he was expelled from Alexandria where he was a priest in 321, but in time his views gained momentum in exile. By 325 AD, Arius’ controversial teachings had spread far beyond his own see, which caught everyone by surprise. Warring factions in the church just simply could not agree what to do with this growing menace, highlighting the distinct lack of leadership that existed in the church. This developing rift in the church worried Constantine. Prior to the Arian crisis, Constantine saw first hand how schisms in the church could unstable things. He had battled fiercely against two schismastic groups, the Donastists and Meletians, both in North Africa and Egypt respectively. These two groups were unable to forgive those bishops or priests who had left the Church during Diocletians prosecutions and later returned to it. With these two troublesome groups firmly planted in the back of his mind and now Arius “rocking the boat”, Constantine sought a solution. He decided to flex his imperial muscle and take control of the matter at hand and announced a great council, the first “Ecumenical Council’ inviting every bishop in the Empire to attend in 325 AD. Approximately three hundred and eighteen bishops gathered at Nicaea, near Constantinople. An overwhelming majority were Eastern Bishops with a reported handful from the west. The Council discussed minor matters from baptism, to setting the dates of Easter, the Meletian schism to the burning issue of the relationship between the Son and the Father. One can only imagine how fiery and robust debate amongst the bishops would have been. Undoubtedly, there would have been a lot of hotheads with egos to match. There were even rumours of alleged punches thrown at Arius on the council floor. Next up The Nicene Creed. Click here to continue with Byzantium’s story. Photo credits: The header image is an Eastern Orthodox icon depicting the First Council of Nicea 325 AD. It is used under the Creative Commons Attribution-Share Alike 3.0 license. 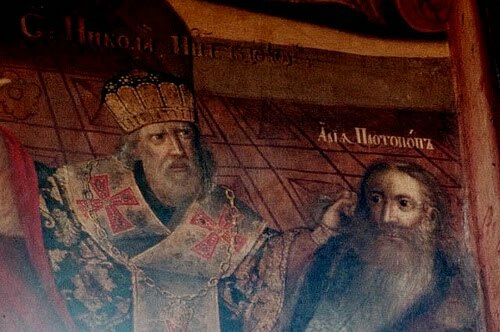 The second image used here shows Bishop Nicholas of Myra allegedly slapping Arius at the First Ecumenical Council. Enjoyed this great intro to the The Council of Nicaea! WWBF – World Wide Bishop’s Federation! Here’s a message which is related to Christ’s divine nature although I’m not sure how historical it is. There are I believe 12 universes. Christ is God’s son for our universe. He has 11 brothers. This is very interesting for me because 12 and multiples of 12 are mystical numbers in the bible and many other places including astrology and mythology. I think there’s two separate creation accounts in the Book Of Genesis. The first is: ‘”Let there be light,” and there was light.’. I think it was Edgar Cayce who said this ‘light’ was Christ Himself. This matches up with the Gospel Of John since John describes Christ as the light of the world. For the second statement God speaks as more than one person which I guess implies that the Trinity existed at that point. The last feast day in the Catholic Church’s liturgical year is Christ The King or ‘Jesus Christ King Of The Universe’. That’s true I believe. Plato felt that the dodecahedron geometric solid was a representation of all of creation. This geometric shape has 12 faces. There’s a scientist who works at the Paris Observatory by the name of Jean-Pierre Luminet who agrees with Plato about the dodecahedron and the 12 universes. I guess old Plato was right after all. The following book explains all this. Here’s my review of a biography about Saint Augustine. Augustine lived some years after the Council Of Nicea. However the Donatists were still around and they became dangerous enemies for Augustine. But this turned out to be an unwise choice on their part. Here’s my review of that biography about Saint Augustine. There’s an interesting aspect of this book. After it was written additional writings by Augustine were discovered which were the Divjak letters (1975) and the Dolbeau sermons (1990). Author Peter Brown updated his original book by adding a 2-chapter epilogue where he talks about how his book would have been affected if he had had those additional writings. The epilogue is like Brown’s review and critique of his own book. I lost track of what exactly Augie didn’t agree with some of those people about if Brown even did explain it. Because of this emphasis on controversy Brown’s book portrays Augustine as a very stern, authoritative figure who, like Moses on Mount Sinai, was constantly on the verge of casting the stone tablets down on humanity. And that is not a totally inaccurate picture. However in the epilogue Brown feels he placed too much emphasis on those philosophical controversies. He feels he should have included the non sensational aspects of Augie’s life as a dedicated priest and bishop. Brown’s updated view based on the discovered writings is that Augustine was often a voice of moderation compared to some of his contemporaries such as Jerome and Ambrose. Augustine believed in and lived what he preached about. The rules for his monastery were based on how the apostles lived as indicated by the Acts Of The Apostles in the bible. Augustine was almost assassinated by a Circumcellion hit squad. The Circumcellions were the resistance branch of the Donatists. Fortunately Augie’s guide took a wrong turn. Augustine was instrumental in causing the Roman government to turn against the Donatists and many of them committed suicide. Author Henry Chadwick felt that Brown’s book is ‘biography without the theology’. Brown feels this is a fair assessment. I agree also because while Brown mentions many philosophical systems such as neo Platonism he doesn’t delve into them in any detail. Nor does he discuss Augustine’s theology in detail. But then again doing that might have made this large book twice as long. Chadwick wrote his own Augustine biography which I haven’t read but which apparently includes the theology all in 119 pages. Another of Brown’s conclusions is Augustine himself may have become a little narrow minded and he could have done a better job of merging his Christian ideas with his neo Platonic views. Author Hilary Armstrong shares this view. Whether I would agree I don’t know since I haven’t read any books about Plotinus. However Augustine didn’t have the luxury to just sit and meditate and write books all the time. Augustine was a key figure in establishing some of the basic tenets of Catholicism. But to understand exactly how he did this would I think require reading some more books about him. Augustine may have done this not so much by what he said and wrote but rather by how he lived. Augustine, Ambrose, Jerome, and Pope Gregory I are called the four ‘great’ doctors of the Western Church. This is a serious book. It’s not something someone is going to read in one night. Looking forward to the next post! Thanks for the list of books at the end of the post, I don’t know much about the Byzantine Empire so this is all very interesting. “I like that Jeff Marzano quotes himself in the third person,” said Yesterday Unhinged.